Before 1948 general practice was a cottage industry. Most GPs worked independently usually from a consulting room in their own house. There were few if any staff with the duties of answering the phone usually falling to the GP’s wife (most doctors were at that time male) or in some cases a housekeeper like the indomitable Janet of Dr Finlay’s casebook. When the NHS was created General Practitioners feared the idea of becoming salaried employees of the state and held out against it … Eventually a compromise deal was reached in which GPs would work for the NHS but as Independent Contractors rather than employees. Much of that independence was however illusory. Whilst GPs remained free in some ways to organise their own practices the work they did for the NHS was controlled by a very tightly defined contract. A framework already existed; Lloyd George’s National Insurance Act of 1911 provided for limited health cover for working men (but not their families). The scheme was administered by Local Insurance Committees covering counties and large conurbations which held a list or panel of doctors prepared to work under the scheme. The panel doctors were subject to “Terms of Service” which were later lifted directly into the NHS GP contract. The NHS also adopted the medical cards issued by Local Insurance Committees. and the record system consisting of cards contained in a card “Lloyd George envelope” which were still in use up till a few years ago. This meant that each GP was personally responsible for the care of his or her patients 24 hours a day 7 days a week and 365 days a year. Any failure in that provision could result in being hauled before the dreaded Medical Service Committee and “withholding of remuneration” or fines. For single handed doctors this meant being on call to patients literally round the clock with no respite unless they could find a locum which was not easy. Even for those in partnership it meant a gruelling on duty rota. As well as the doctor himself the family were involved as at nights and weekends GPs were on call from home with no other provision for answering the telephone. By the early 1960s working conditions were such that there was a major recruitment crisis in general practice with newly qualified doctors preferring to work in Australia or Canada to the NHS. The then Health Secretary agreed to the 1966 Doctor’s Charter which provided amongst other things access to funding for new surgery buildings and partial reimbursement of the wages of ancillary staff. It also included a “Group Practice Allowance” to encourage GPs to work together in practices. Despite this individual contracts and personal round the clock responsibility remained. Group Practices provided some respite as it was possible for the doctors to take it in turns to cover the Out of Hours period when the surgery was closed. However since the average partnership size was only 4 or 5 doctors this still meant around one night a week and one weekend a month and more if a partner was away on holiday This was in addition to daytime work in the surgery. In some large cities commercial deputising services were set up employing doctors to cover the out of hour’s period but these just weren’t viable in much of the country. Their use was also often limited by the local Family Practitioner Committee and frowned on by politicians who felt that some GPs were being paid for staying in bed. The fact that these doctors in had to give up part of their own income to pay the deputising company was either not understood or glossed over. My own experience was that I entered General Practice in 1972 choosing deliberately to go to an area which wasn’t covered by a deputising service as I felt I wanted to give complete care to the patients in my practice. At first as I was only 28 and came from working a hospital rota of 1 in 2 the work seemed manageable. Sometimes if I had been up in the night there was even an hour between morning and evening surgeries to take a nap. I even enjoyed some night calls especially in the summer. Going out and being able to relieve pain or help someone with breathing problems could be a pleasure although it didn’t stop one from being tired the next day. Over the next few years however things began to change. Daytime surgeries got busier and the gap in the middle of the day disappeared. Although most patients were reasonable, an increasing minority regarded it as their right to call the doctor to visit in the evening regardless of whether it was an emergency; some names cropped up so regularly that they were suspected of deliberately waiting till the surgery was closed. Some even thought they were calling a special night service instead of their own doctor who had already been working all day. Family life had to be planned around the on call rota; my wife who by now had her own job had to be home by 6pm to answer the phone and during weekends couldn’t leave the house at all. The children were also restricted; it was only recently that my son, now in his 40s, told me how upset he was by my weekends on call. I was on call and unable to visit my wife in hospital after our second child was born and was also on call when my older son had a serious accident at home. My memory is kneeling beside him trying to staunch bleeding with one hand whilst holding the phone in the other trying to find someone to cover my duty. Social life also suffered as non-medical friends just couldn’t understand why we couldn’t join in all of their activities. Even when it was possible to go, I soon established a reputation for going to sleep at the dinner table due to having been up all night before. In my practice weekends on duty began at 9 am on Friday and lasted until Monday evening. During the week before I would become increasingly tense and on the Monday night relaxation came only from a bottle. One small additional factor that no one seemed to consider is that GPs answering night calls to patient’s homes had to drive themselves often whilst in an exhausted state. As I turned 40 the thought of continuing to work like this for the next 25 years filled me with horror but there seemed little likelihood of change and I remember being treated as an oddity by some senior colleagues at a local Royal College of GPs meeting when I said that I thought we should work to change the contract. Gradually it became apparent that I was not alone amongst doctors and there were also other forces at work. There were an increasing number of women entering general practice who often needed to juggle family commitments around on call duties. What childcare facilities there were in the NHS ceased to operate outside “normal” working hours. Spouses of both male and female GPs had careers of their own and couldn’t be at home as an unpaid telephone answerer. Workload continued to rise and Kenneth Clarkes’ imposition of a new and more demanding contract in 1990 made many doctors feel that the trade-off of 24 hour responsibility for independence was increasingly unattractive. A BMA survey showed that an overwhelming majority of GPs would now like to be relieved of the 24 hour contract and in 1992 the BMA began a campaign to get rid of the contractual obligation which made GPs themselves responsible for organising & providing a round the clock service. We adopted the slogan “tired doctors are not good doctors” Surprisingly considering their recent handling of the issue the Press were largely sympathetic and understood that GPs couldn’t go on working all hours. As so often happens, politicians refused to listen to the arguments with ministers claiming that most of the time GPs were on call they were comfortably at home with their families. “They were in any case” it was stated “paid a generous fee for night visits after 10pm which amounted to only a handful each month”. This ignored the fact that the greatest burden of out of hours work was in the evenings and weekends. On a single Sunday at around this time I was called out 37 times only 2 of which qualified for these payments which were in any case only payable to GPs working in small rotas of less than 10 doctors. The GP payment system was and still is complex but the total amount earmarked for Out of Hours duties including Night Visit Fees was an average of just under £6000 per GP per year. Around 1994 the Department of Health organised a meeting of Family Health Service Managers from around the country which was intended to brief them on the government line on maintaining the 24 hour contract. But they were in for a shock as instead many of the managers reported that their local GPs were on their knees and the system was unsustainable. When Stephen Dorrell became Secretary of State for Health he vowed to resolve the dispute. What he produced were some small changes in the wording of the contract which made it clear that GPs did not have to respond to every request for a home visit and that the full night visit fee would be paid to doctors working in larger rotas. In addition there was an Out of Hours Development Fund which would pay out an average of £3000 per GP to support and encourage new ways of working. The response of GPs was immediate and massive; all over the country groups got together and formed cooperative organisations sharing the out of hours calls between a large number of local GPs. Within months premises were found and staff such as receptionists and drivers employed some employed nurses with enhanced training to triage calls but the medical work still had to be done by local doctors themselves. In some cases this was on a compulsory rota in others it was possible for the doctor to buy out of his or her shifts and pay others to do the work. But the bottom line remained GPs still had individual responsibility for the provision of a service to their patients round the clock. If the cooperative collapsed or not enough doctors were willing to do their shifts then it was back to GPs covering their own out of hours. Experience was that it needed a minimum of around 40 GPs to set up a successful cooperative which was relatively easy when based on a large town. But against all the odds they also were made to work in more rural areas such as Cornwall. But not every GP was part of these groups; in remote areas where a cooperative was not possible they continued to be responsible for providing round the clock cover them. And the commercial deputising companies continued to operate in large conurbations. Patients largely took to the new system where instead of getting a home visit from their own doctor or a partner they would unless bedbound go to be seen at a special out of hour surgery is. In some cases this meant travelling to a nearby town and inevitably there were complaint s about the delay involved which was taken up vociferously by local MPs. At the same time there were some reports by the Health Service Ombudsman of problems mainly involving commercial deputising services in one complaint in which I advised the Ombudsman there were insufficient doctors employed and a 7 hour delay in seeing a seriously ill patient who died. As a result of these concerns the DH commissioned a team under Dr David Carson to investigate GP out of Hours Services. The Carson Report published in 2000 proposed some stringent quality standards and made it clear that these should apply not only to organisations such as deputising services and OOH cooperatives but equally to individual GPs & practices providing their own cover. It is clear that Minsters of the time and the Department of Health were enamoured of this idea as a subsequent report of the Health Select committee was to reveal. By the start of the 2000s for a number of reasons General Practitoners’ morale was at an all time low. Recruitment was increasingly difficult; whereas in the 1980s an advertisement for a partner might bring in as many as 80 applicants by 2000 there were rarely more than a handful. Some practices got none at all leaving the existing partners to cope with an ever increasing workload. As stated at the outset the GP Contract had its foundations in a document produced in 1911 and the payment system was arcane.to the point that many GPs themselves couldn’t understand it. As Independent Contractors GPs have never received a salary from the NHS instead there was a complex system of fees and allowances detailed in an increasingly thick volume known as the Red Book which made up the total practice income. The doctors’ personal income derived from what was left after paying all the running costs of the surgery including equipment and the staff. In a national ballot GPs called overwhelmingly for a new contract. At the same time under the influence of Downing Street advisors the government had its own agenda including opening up primary care to a wider variety of providers and introducing a form of performance related pay. So the clause in the new contract which allowed GPs to opt out of their total 24/7/365 responsibility clearly suited both sides. It must be stressed that this did not abolish the out of hours GP service it merely passed the responsibility for organising it from individual doctors to the Primary Care Trusts As for the cost: much has been made of a subsequent television programme in which 1 of the 8 BMA GP negotiators expressed surprise that it was only £6000.But this figure wasn’t plucked out of the air; it equates exactly to that part of GPs’ pre 2004 income which was earmarked for out of hours work. As well as this £6000 per GP Primary care trusts would have access to the £3000 per GP in Out of Hours Development fund. In other word s they had exactly the same amount of money that GPs had used to fund the very successful Out of Hours cooperatives. In less than 10 years with GP cooperatives had built up a great deal of expertise in organising out of hours cover and their management boards comprised local GPs. It might be supposed that PCTs would automatically want to use this expertise. But this was not the case. The NHS Confederation (the managers own organisation) told the Health Select Committee that few PCTs were working positively with GP co-operatives, often instead being adversarial and generating conflict. In Buckinghamshire the GP cooperative was forced out of business literally overnight when the PCTs awarded the contract to a large company called Harmoni. In Cornwall the exemplary Kernowdoc was passed over in favour of Serco. Both Harmoni and Serco has since been the subject of major complaints and in particular have been accused of failing to employ sufficient doctors. Ironically these cases mirror the very situation which led to the Carson Report. Despite these experiences a recent bid by a group of East London GPs to take back organisation of Out of Hours care for their patients was passed over in favour of a private company. It is clear that the blame for any failings and shortcomings in Out of hours GP Services should rest with not with GPs but The Primary Care Trusts which were until April 1st 2013 responsible for arranging the service As long ago as 2004 the Health Select committee recognised the risks and warned that many PCTs had failed to consider fully the risks and the responsibility for organising Out of Hours services was often being handled at a junior level .It is clear that in many cases this warning was not heeded. With regard to the rest of GPs work there is no doubt that the 2004 Contract delivered a very welcome funding increase to practices and therefore an increase in GPs personal income but in the intervening 9 years this has been steadily eroded as funding levels have been frozen whilst the running costs of surgeries and staff pay have increased. In addition the Department of Health has year on year increased the work that has to be done in order to qualify for payments. Despite being relieved of the round the clock responsibility most full time GPs are working hours well above the national average. Excellent description of how we have got to where we are. There is now a confusing array of choices available to patients when they feel that they need urgent attention. Choice is of little value when the patient does not have the knowledge or time to weigh up the alternatives. Their choice can on occasions put life at risk. The simple answer, instead of creating an array of alternatives, many of which were frankly dangerous, would have been to make the local “A&E” the default when GP surgeries close for the day. OK – so if most “A&E” departments are too small or understaffed to cope, then the Treasury needs to give the local hospital the finances necessary to enhance their service. Getting the private sector involved was a red herring that played into the hands of politician profiteers. 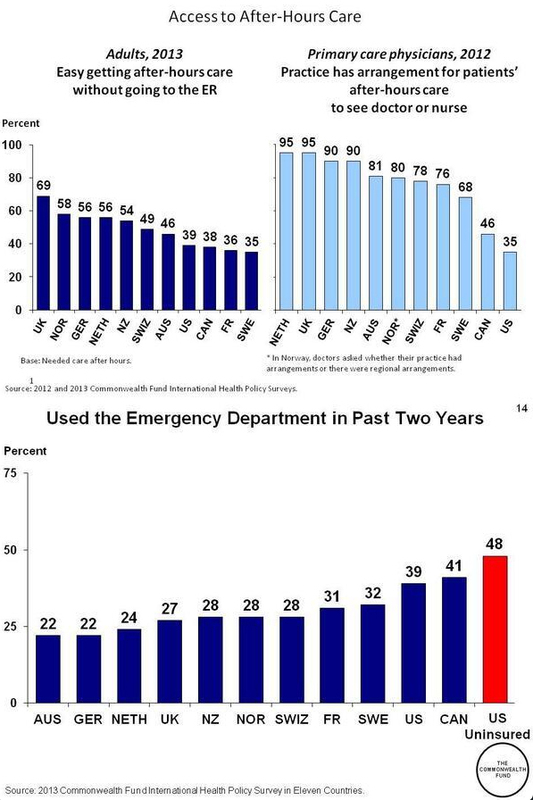 The term “A&E” needs to be changed to “Emergency Department”. One of the main problems with this delegation of duty is the availability of the patient’s “GP” case notes when they bowl up at an alternative service provider. Why has nobody solved this Communications/IT black hole? Excellent account. I do remember (as a hospital doctor) feeling very sorry for my GP colleagues esp. female GPs who had to work day and still had to provide night cover. One of my GP colleagues who lived near their surgery recalled how some patients would go to his house at night for medical advice, often non-urgent. The public (and many politicians) think GPs can and should provide 24 hour service. There is no way GPs can provide such service. The other key dynamic driving GP despair over OOH work was the increasing risk of complaints over this time. The risk of complaints from OOH scenarios was much higher than those arising in office hours. So we had work that was poorly supported, poorly paid, a strain on us and our families, increasing and apparently unrestrained demand, increasing complaints, exhausted doctors at risk of making mistakes. Not a satisfactory combination for any service- either for us as providers- or in terms of safe and effective service to our patients. The GP OOH co-ops worked well- and not using their knowledge was a mistake by health boards and PCTs. Somehow or other we need to get to an effective NHS system response to patients whatever time of day…but not one that leaves the workers routinely exhausted and at risk of making mistakes. How I wish this excellent resume could be publishes in all the national newspapers & our patients be more aware of the history & difficulties GPs encountered, & the new challenges they are faced with now. Only today the headline letter in The Telegraph is from a lady in London who lays the failure of OOH squarely at the foot of the GP ( with a few negative comments about he access to day time GP too). There is , unsurprisingly, no evidence to back up her assumptions, just plenty of ammunition fired at her nearest & easiest target. Thankfully there is also a letter from the BMA adjacent to hers, but why hasn’t the latter been given the headline, rather than some apparently unhappy, prejudiced, female patient ? What would the general public do, if by valuing us so little, lost us completely & only had a private service to access? Would they be so blaming as they are now? Thank goodness I am in the latter stages of my career. No doubt for brevity, Eric has missed out that the General Practice Committee (GPC) urged GPs to accept the new deal in 2004, largely selling it on the removal of responsiblity for organising out of hours. This meant that there would be an inevitable ratching up of contractual day-time duties with the abiltiy of DoH to impose any change of contract unilaterally after 3 months of ‘negotiation’. This has resulted in massive bureacracy, tick-box filling and a sense of loss of control in GPs – plus of course increase in day time work-load. We were told by the GPC that the government would never dare to impose contractrual changes unilaterally! The review body system has failed totally to increase remuneration in line with increasing costs – hence the reduction in take home income. Most GPs had already largely sorted out their personal out of hours care prior to the vote in 2004. A firm rejection and continuation of the status quo would have been better that what current GPs now have. Even if Reade would not renegotiate, Secretary of States for health revolve pretty quickly and the next incumbent would have met at the table again. Many GPs warned clearly of these dangers. An excellent piece from a stalwart proponent of a better working life for GPs. I hope he is enjoying a well-earned retirement. The final nail in the coffin of a quality ooh service from experienced GPs was the unwise [I’m being charitable here] idea of Gordon Brown for us to provide ‘extended hours’, an offer few of us could refuse. As a GP in my mid-fifties I was happy to do a few ooh sessions a month, but not this as well. Which to ditch? No-brainer. I’m so glad I retired on 31.3.13 because of the totally predictable mess following the Health & Social Care Act 2012! Thanks, Eric, for an excellent review of the problem. You don’t mention that in 2004, the decision to keep responsibility for OOH was a whole practice one – it was no longer possible – as it had been previously – for one or more GPs within a practice to continue OOH cover while others paid for deputising or joined a co-op. As far as the ability of the government to impose changes in the GP Contract goes, this was established by Kenneth Clarke in 1990: he made it clear that a GP Contract is not a contract in any legal sense – so nothing new there – and at the very least, the 2004 New GMS Contract removed, once and for all, the Red Book system whereby any “overperformance” by GPs in a shrinking workforce simply resulting in the “overpayment” being clawed back the following year – which had to be an improvement! Good luck to all those remaining at the coal-face: looks like you need it. When the PCT led service took over in 2004 – although our population coverage doubled our workload quadrupled – and so did our staffing – going up from 4 staff at thew co-op ( Nurse , GPx 2 and driver ) to 2 call handlers , 3 nurses , 3 doctors , 2 drivers and a Nurse practitioner ( my new role in the PCT led OOH service ). We regularly took 80 calls per evening and also because we were now based next to A&E we also did our best to filter primary care problems out of A&E . I can see a whole historical trail of how little the public now fail cope with the simplest of health problems despite there being a whole raft of options such as NHS Direct , pharmacists before needing to call OOH or go to A&E with inappropriate presentations . Thank you for an excellent summery. My father was a GP who qualified in 1971 and I am in practice today. Your memories about the impact on family life of wives manning the phones and families stuck at home strike a chord with me. As a working mother, GP and married to a GP I would shudder at thought of trying to work in that way today. I am trying to write a history of NHS General Practice and was thus most interested to come across your article. My own time as a GP began in 1980 and I would love to interview you if you were willing. Please let me know on the email below if you are. It is going private already. Sadly private companies don’t actually like anyone who has the faintest whiff of atual illness/disease, and these will be the people left to be looked after by a salaried GP service. This is an interesting deconstruction of GP services. Excellent summary. I wonder what percentage of the UK were still doing their own OOH by the time the new contract started? I am a GP in South Powys, and we did our own right up until the contract change, but not through choice. I suspect, but I would like it confirmed, that most of the UK was using either deputising or a co-op by 2004, so most patients in the U.K. were unlikely to have seen their own doctor at nights even 13 years ago and beyond. I think that the thing that our patients miss most is the Saturday morning surgery which extended the chance to be seen with notes and practice staff and was more like a ‘normal’ appointment, and in retrospect that should have stayed. Apart from that the contract change shouldn’t have had much influence on OOH, unless the trusts interfered with the providers, which they did, of course. As for lack of GP appointments leading to no beds in the hospital , how is that? Are these GP patients seen in a hospital bed?